If at anytime within the first 48 hours of care you are not satisfied with your caregiver for any reason, just call us and your care will be absolutely FREE. That’s our money back guarantee for new clients. We understand that needing home care service can often arise unexpectedly or sudden without much notice or warning. Families today have a multitude of choices when it comes to home care. Many families have never dealt with the situation of needing a Live-in caregiver for their loved one. It’s not uncommon to be a little hesitant or apprehensive and to have many questions about how it all works, but when a loved one can no longer be alone, it really is the best option for remaining at home. It also provides great “peace of mind” in knowing that your loved one is at home, where they prefer to be, receiving one-to-one care by one of our excellent caregivers. 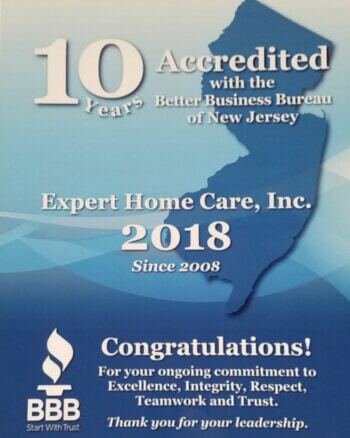 In fact, our agency has been recognized with the “Best of Home Care” Award in New Jersey for 8 consecutive years, from 2011 – 2018. What kind of sleeping arrangements do I have to provide? We created this offer because there are many situations that do arise suddenly where quick decisions need to be made. When you call us we will spend the time together discussing all the details and schedule a visit with you into the home to further assess the situation. This is a FREE no-cost, no-obligation visit. When you decide to use Expert Home Care the caregiver will be driven by us to your door and the 48 hour guarantee period begins. 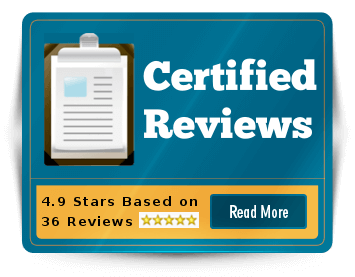 Now, with this exclusive offer from Expert Home Care, you can rest easy and give it a try, and if you don’t like our service for any reason after 48 hours, just give us a call and pay nothing. Read through the rest of our website or call us now to learn more about our experience providing and specializing in Live-in care for New Jersey’s seniors. At Expert Home Care, we specialize in recruiting, hiring and placing Live-in caregivers. It’s our main focus and priority! When you need a caregiver fast, Expert Home Care can come through for you. We perform all the standard pre-screening checks that you would expect from an agency. But the most important item in our opinion is that you are getting an experienced and compassionate caregiver who is fully oriented and committed towards living in a client’s home. Our caregivers are flexible and many of them have been doing this for several years so they know what to expect. Our caregivers usually live in 7 days per week and can stay for consecutive weeks at a time, all of which leads to a better bond and enhanced continuity of care. All home health aides are NJ State certified and all personnel are carefully screened, tested and bonded prior to placement in the home. They are also required to pass pre-employment physicals and undergo competency evaluations. Expert Home Care also does comprehensive criminal background checks and DMV reports on all personnel. To ensure a successful placement, we match the caregiver’s skill level to the specific needs and personality of each client.